To publicize a film-archive service, a well-written, attractively presented blog may serve as well as a paid advertisement. The Huntley Film Archives, based in rural Herefordshire, has recently begun to take that route to spreading the word about its holdings. Its blog — The Voice from the Vaults — makes for fascinating reading whether or not you are looking to buy film clips. 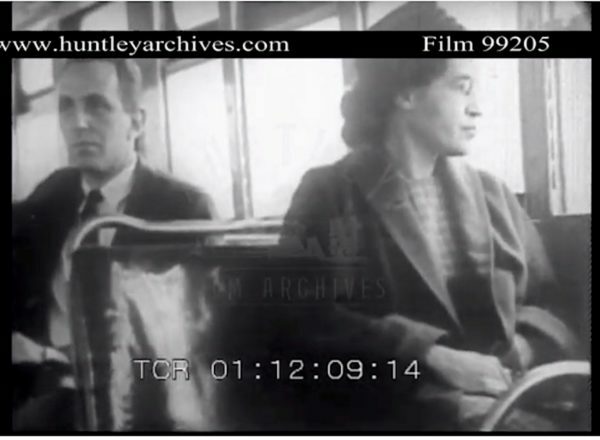 With weekly postings about selections from its more than 80,000 historic titles (searchable through an online database), Huntley has featured such slices of its collection as films about women in the 1960s British coal mining industry, Rosa Parks and the Montgomery (Alabama) Bus Boycott of 1955-6, anti-Vietnam war protests of the 1960s, farming in 1940s Gujarat state, cockle picking in 1940s South Wales, and, to mark International Women’s Day, films about the daily routines of women in times past, many “innately challenging to our modern sensibilities,” as the Huntley blog coyly put it. Also among recent blog posts, one provided a tour through the archive’s own storage vault and provided advice on how best to preserve family films at home. 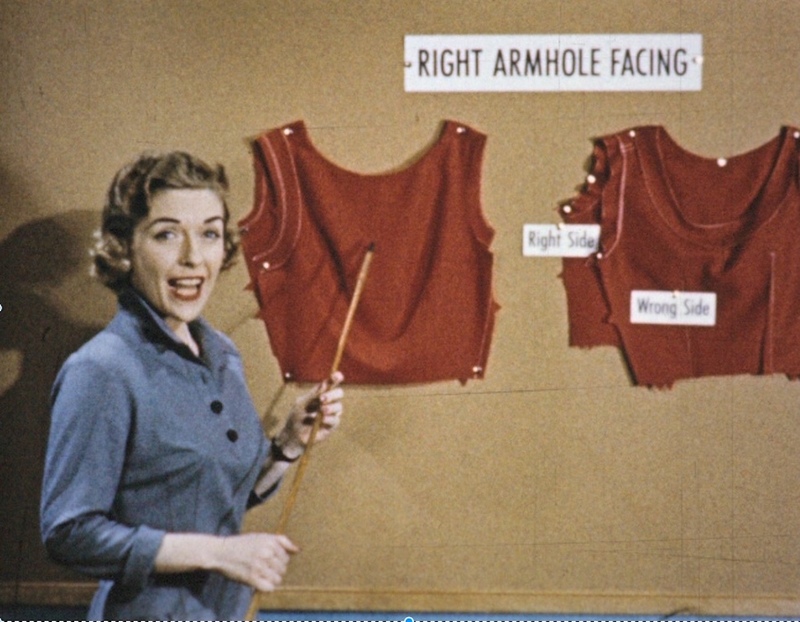 One posting showcased Huntley’s range of films about sewing. In case you hadn’t heard, sewing is currently all the rage — not in the league of yoyos, Rubik’s Cubes, or finger spinners, perhaps, but in the United Kingdom, the BBC’s Great British Sewing Bee has been running since 2013 and reviving the craft. In the reality television show, amateur sewers compete to be named Britain’s best home sewer by taking on such challenges as working with recycled fabrics, mastering sewing techniques from around the world, and creating such fashions as a double-breasted waistcoat. 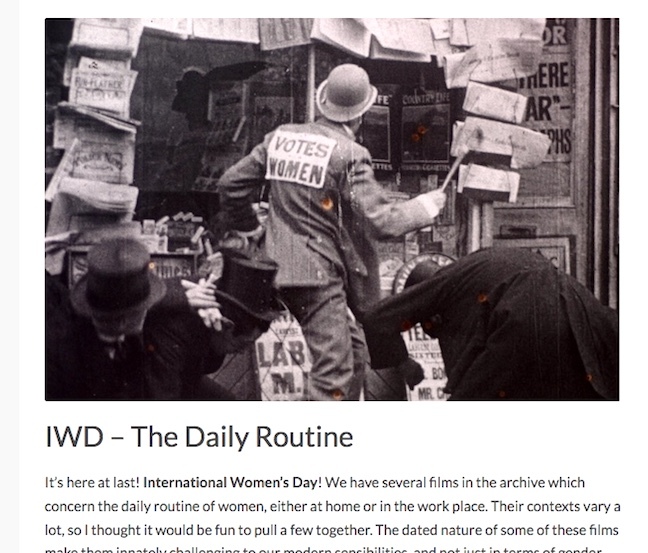 Turns out the Huntley archive has films going back decades that teach or feature sewing. The blog posting samples such holdings as an American film from the 1950s showing how to use a Simplicity brand pattern to make a sleeveless pinafore dress (image above), a World War II short about the production of utility clothing, and footage about a garment factory putting on its own fashion show. Rosa Parks defiantly rode public buses in Montgomery, Alabama, in 1955, as depicted in this film held in the Huntley archive. Her treatment by white riders led to the Montgomery Bus Strike. The post, which provides a link to Huntley’s online gallery of sewing-related titles, also reminds readers that the technology behind film projection was inspired by the mechanism of sewing machines. The Huntley collection is one of the largest commercial film libraries in the United Kingdom. It licenses items to broadcasters and film-production companies from a collection that dates from 1895 to the present, and that emphasizes social history from Britain and around the world in such areas as advertising, architecture, art, education, entertainment, fashion, food, history, industry, media and technology, medicine, public personalities, religion, science, and transportation. A browse through the company’s catalog reveals many fascinating artifacts, and fodder for future posts, including color film of Tibet in the 1940’s; an announcement of the death of Martin Luther King; the steam train used in Harry Potter and the Philosopher’s Stone; a 1960s speech in Cleveland, Ohio, by Carl Stokes, America’s first black mayor; and panic buying in U.S. supermarkets during the Cuban Missile Crisis. Aman da Huntley and her father, the late John Huntley, established the company in 1984. He was a key figure in British film collection and presentation who got his start in the industry by landing a job during his teens as a teaboy at the Denham film studios of Alexander Korda, the Hungarian-born director who had worked in Hollywood during the transition from silent films to talkies. Huntley went on to become a prominent figure in the British film industry, and along the way built a personal collection of films primarily relating to transport but growing to encompass all topics and periods. That permitted him and Amanda Huntley to set up their film archive in 1984, while John Huntley continued his work in film and television presentation and publishing up to the time of his death in 2003, at the age of 82.